In November 2012 I sold my R1150GS and bought this 2005 Dakar. I put many rough miles on the big GS and was tired of picking it up so often in the rough stuff. With it's 41 litre gas tank I often found it to be too top heavy for the non-maintained roads I like to ride on. I believe that the smaller lighter 650GS will make the job a little eaisier for me. The '05 Dakar has less than 12k miles on her and came to me with a set of new sprockets in the bag ready to install as well as a set of Michelin T-63 knobby tires ready to mount. I spent many winter evenings in the garage adding numerous accessories to make it ready to hit the back roads the way I like it. I still have more improvements to make including rebuilding the front forks and replacing the rear shock. A larger windscreen might be required as well. I also ran wiring for the battery tender, Gerbings and Garmin GPS. 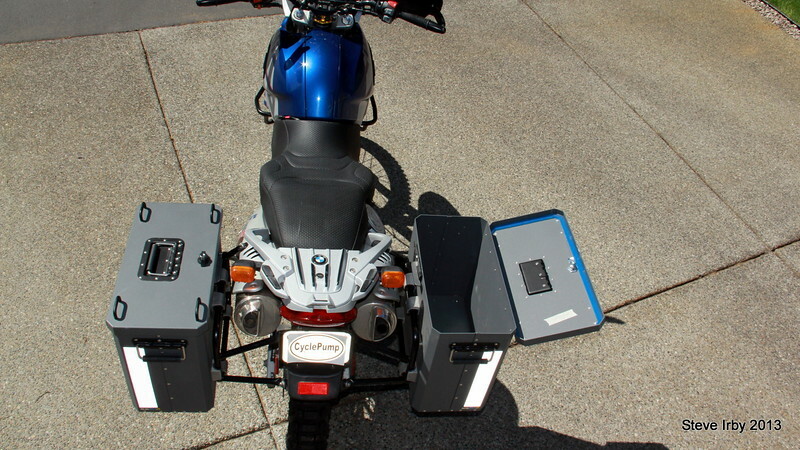 I picked up a set of Wolfman soft tank panniers from BestRest also, which will serve as my "glove-box" on road trips. I took most of these photos when the bike was dirty, just before a 160 mile ride. I then washed it and mounted the tank panniers. Spacious and capacious....and 41.5" wide! No lane splitting for me. I am glad I didn't get the largest 45 Litre size .